Author: Archibald Norman Tucker †. Edited by: Chet A. Creider. In collaboration with: E.D. Jakeyo Ang’ina, T. Okelo Odongo, J.N. Olum Oludhe. Series edited by: M. Lionel Bender †, Franz Rottland †. The Luo language (Dholuo) stands at the extreme southern end of the extensive linguistic unit known as Nilotic languages. With about 3 million speakers, Luo is one of the most important Kenyan languages. 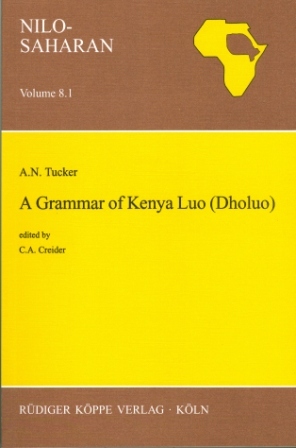 The publication of Tucker’s A Grammar of Kenya Luo (Dholuo) is a welcome event. 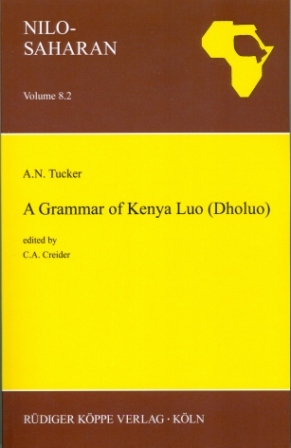 GKL is the first detailed reference grammar of the language, commonly referred to these days as Dholuo. GKL’s publication came fourteen years after the author’s death. Tucker worked on the grammar, on and off, for two decades, but did not live to see it in publishable form. Chet Creider undertook the ardous task of getting the complex manuscript into a form suitable for publication, and for this he is to be congratulated since the result is a work that will be of considerable interest to specialists on Dholuo and Nilotic languages. [...] For non-specialists, its utility will depend on the degree to which users are willing to spend time working out answers to questions themselves from the great fund of illustrative material. Die posthume Veröffentlichtung von A.N. Tuckers zwischen 1960 und 1980 entstandener Beschreibung dieser Sprache durch Chet Creider stellt [...] eine unschätzbare Bereicherung dar. Drei Faktoren sind es vor allem, die zu dieser Einschätzung führen: der Datenreichtum, die genaue Tonmarkierung aller Beispiele und das etwa 2.400 Einträge umfassende, ebenfalls durchgängig tonmarkierte Dholuo-Englisch/Englisch-Dholuo-Wörterverzeichnis.